Every werewolf on the Dallas Swat dreams of finding the one and Landry Cooper is no different. Things haven't been easy for Landry. During a tour overseas he was badly injured, causing his werewolf gene to kick in. The memories still haunt him but with the help of his pack, he has been able to put some of it behind him, though not deal with it fully. When in the process of cashing a check he meets Everly Danu, like all things in Landry's life it quickly gets complicated. The bank that they are in gets robbed and Everly is taken hostage, thus forcing Cooper into action. You'd think that taking out five bank robbers single-handedly would make someone a hero but for the internal affairs division, it only makes Cooper look suspicious. It all implodes pretty quickly when Cooper finds himself dealing with a ghost from his past in the military and the Danu's reject him because he's a werewolf. What's a good werewolf to do when it seems that the stars are aligned against him? To Love A Wolf had a very surprising beginning. Rather than having the book begin when Landry and Everly meet, Tyler begins the story with Cooper in Iraq attempting to ensure an area doesn't have anymore IEDs hidden. I found myself drawn to Cooper immediately as he tries to disarm the bomb which would change his life forever. There's a lot of military jargon in To Love a Wolf and Tyler took care to make sure the readers always understood what was going on by having Everly be a civilian who needs an explanation. I will however admit that at times it made my eyes wander off the page though. 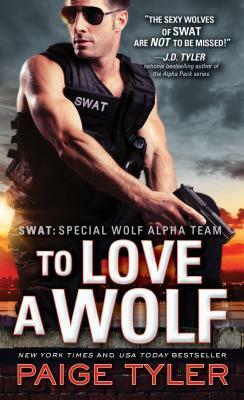 It's been clear since the first novel that the point of the Special Wolf Alpha Team series, is to pair one of the SWAT werewolves with "the one". Woo woo is used to justify the insta love which of course brings about the HEA. Yes, To Love a Wolf actually very much matches the standard script for all paranormal romance which I normally find extremely annoying. What makes To Love a Wolf stand out is that when Tyler got to the point in the typical paranormal romance where the couple reach some stumbling block to their relationship, she actually made it believable. It makes sense to me that seeing a werewolf kill her mother would make Everly mistrust Cooper and every other werewolf. It made sense to me that Everly would instantly flea after seeing Cooper's claws and fangs, so traumatized by witnessing the violent death of her mother and believing the man that she loves (after only three days) to be a monster. In those moments, I deeply felt for Everly. It made her feel real to me and not like some standard love interest. More than any other book in this series so far, I think that Tyler tried to infuse plot points into the story so that it would be about so much more than her chosen couple falling in love and walking happily into the sunset with each other. That being said, Tyler wrote alot about the negative relationship between SWAT and the FBI. I understand that sometimes jurisdictional issues occur but to have Tyler constantly frame the FBI as incompetent is ridiculous. Yes, Cooper is the explosive expert but am I really expected to believe that FBI agents would just waltz into a barn where explosives just might be without getting it checked out first? It pulled me out of the story because of the high level of ridiculousness. If they were so careless, how the hell did they become FBI agents in the first place? Then of course, the FBI has to be wrong about apprehending Cooper and have an attitude about not getting the spotlight. PTSD was continually discussed in To Love a Wolf and I think that the portrayal was pretty good up until the point that it was suggested that once you find someone you love that you can simply learn to deal with the things that haunt you. Cooper in particular was absolutely dismissive of the role that counseling plays in healing. This is a disservice to anyone who is struggling with a mental illness. Swat: Special Wolf Alpha Team continues to have a problem with erasure. Sure, Tyler includes some nominal characters of colour but thus far, they really haven't had a role to play in any of the four books. It makes me wonder why Tyler set her story in Dallas of all places, if she had no interest in making her characters fit the population demographics? I am further troubled by the narrative that because the werewolves are cops that this necessarily makes them all good guys. Really, with everything that has gone on in the last few years it's completely insensitive. I get that this book wasn't meant to be political but I find the blind hero positioning of the police to be tone deaf and blind. LGBTI people don't fare well in this series either. It's book four and Tyler has thus far failed to include a GLBTI character. This is particularly problematic because it is a paranormal romance series which of course seeks to elevate cisgender heterosexual romance. Tyler isn't the only author in this genre to fail to include GLBTI people but that doesn't excuse her decision to opt for erasure. Even if Tyler later decides to include GLBTI people, she's already made a statement by erasing them for four books. To Love a Wolf is a mixed bag to be honest. To Love a Wolf has it's moments where it steps outside of the typical paint by numbers plot, that often appears in paranormal romance, which make it interesting. Unfortunately, it's equally filled with problematic elements which undo some of the work Tyler put in to make To Love a Wolf, stand out from the others in this genre. To Love a Wolf is a book to spend the day reading on the beach and then quickly forgotten. It's bubble gum for the brain.